If the Pacific could lift her wave-fringed skirt along the coastline edge, we would be shocked at the sight of what lies hidden beneath the weave of water, sand, and stone. Many a captain’s ship has been plucked off course… pulled under that salty sea cloth… bounced and battered against the shoreline. Boats of all sizes have succumbed over the centuries… left below… trapped in a briny net of ebb and flow. 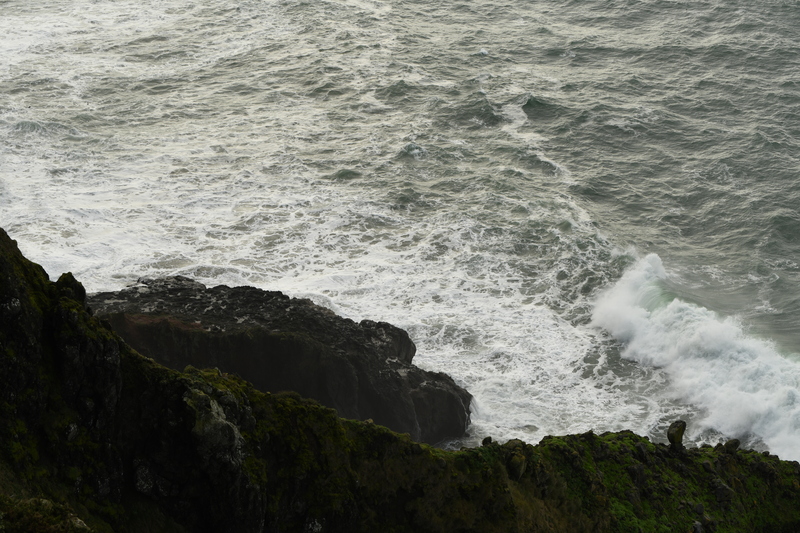 Sea travel along the Oregon coast has historically been a dangerous undertaking. Getting caught in treacherous circumstances near the shoreline has often meant the worst: breaking up, capsizing, and/ or sinking. Beginning in the mid-nineteenth century, a series of lighthouses were built to warn vessels of rugged coastline. Along the Oregon Coast there are nine of these historic structures, each with its own unique story. This journey will take us to five along the Southern Oregon Coast, starting near Florence. The lighthouse is open year-round, weather and staffing dependent. 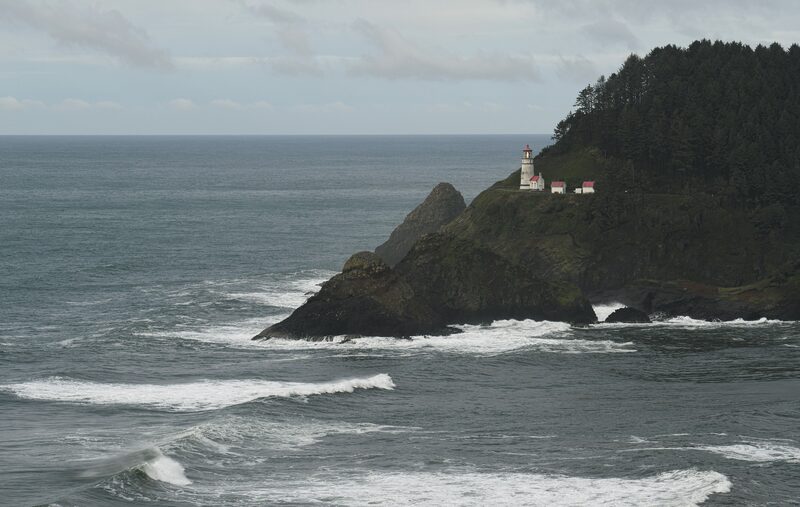 Large groups may schedule a tour in advance by emailing heceta.h.lighthouse@oregon.gov. For more info call 541-547-3416. 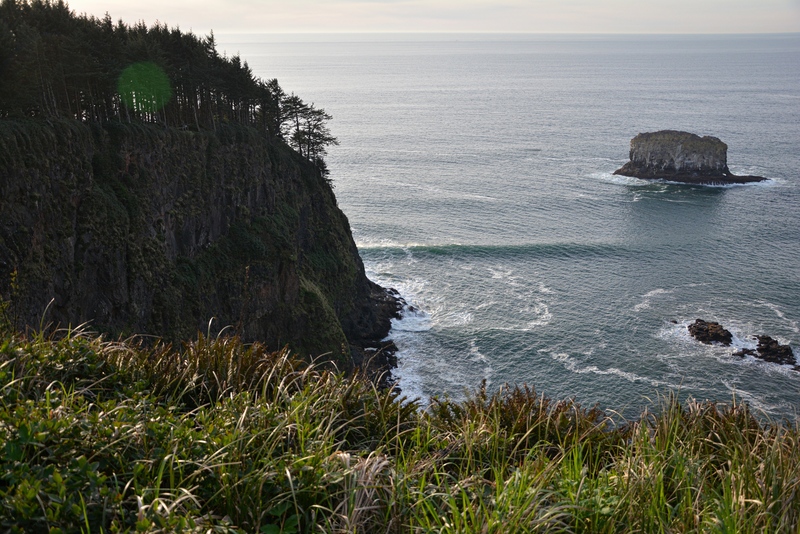 A state parks day-use parking permit or Oregon Pacific Coast Passport is required. Umpqua is the second lighthouse to occupy this site. An earlier structure built in 1857 was the first lighthouse sited on the Oregon coast, but it succumbed to erosion in 1861. 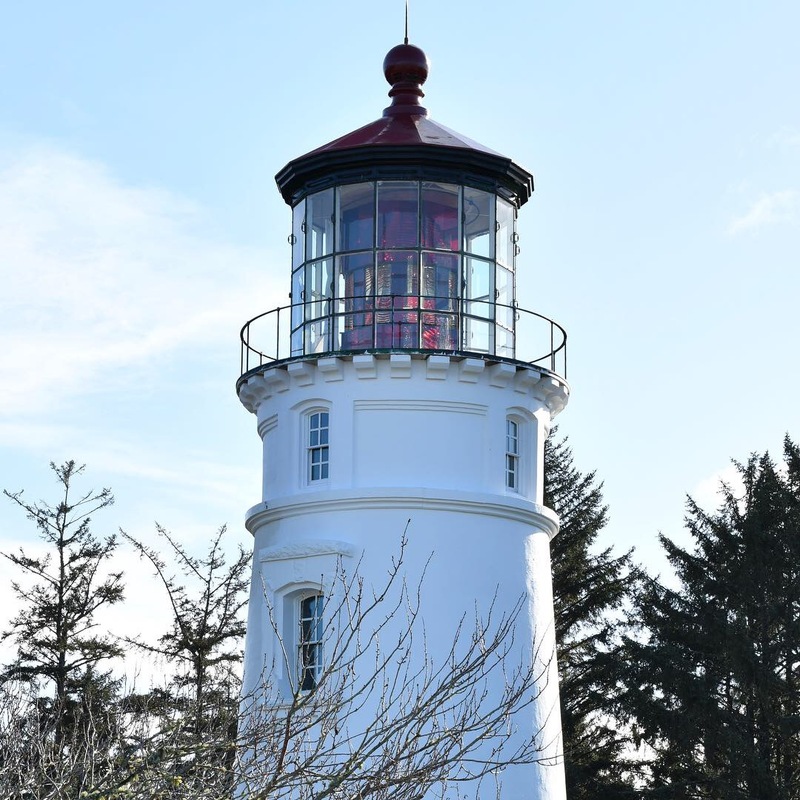 This lighthouse is nearly identical to the one at Heceta Head, and both lights were illuminated in 1894, but the Umpqua lens emits distinctive red-and-white automated flashes. The lighthouse structure and museum are open year-round 10 a.m. to 4 p.m. A lighthouse tour is included with museum admission; $8 for adults, $4 for children ages 5 to 17. Children under five are free. For more info, call 541-271-1894. During Winter and Spring break, trained interpreters are on site to assist visitors in learning about Gray Whale migration off the Oregon Coast. Cape Arago stands 100 feet above the ocean on an islet just off Gregory Point. Its light is perched atop a 44-foot-high tower and was first illuminated in 1934. This is the last of three lighthouses that have protected Cape Arago. The first lighthouse was illuminated in 1866. When erosion on the point compromised safety, a new lighthouse was built. It commenced operation in 1909. In 1934, that lighthouse was replaced when it’s equipment no longer functioned efficiently. That structure was deactivated in 2006. On August 3,2013 the Cape Arago Lighthouse and 24 acres were signed over to the Confederated Tribes of the Coos, Lower Umpqua and Siuslaw Indians*. The lighthouse is closed to the public, but visitors can enjoy the best view of it from 1/4 mile south of the Sunset Bay campground entrance. Listen for the lighthouse’s unique foghorn. 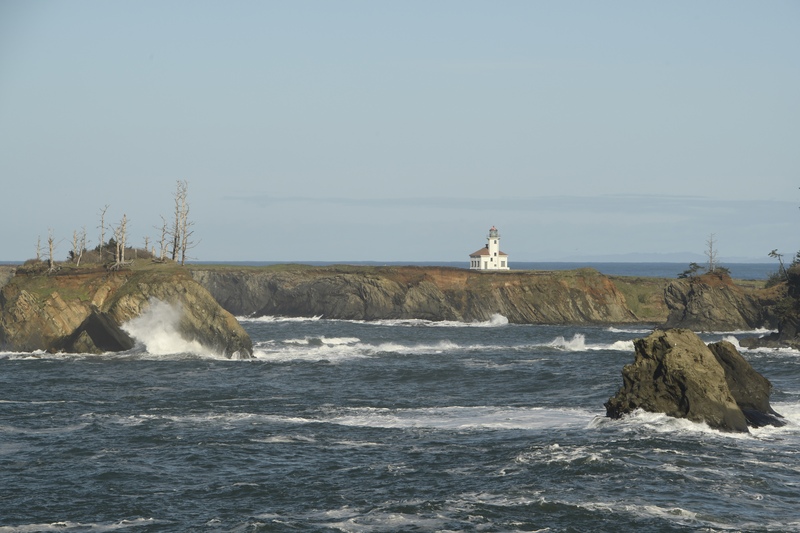 Coquille River lighthouse was commissioned in 1896 to guide mariners across a dangerous bar. It was decommissioned in 1939 following improvements to the river channel and navigation technology. The light shines from atop a 40-foot octagonal tower. closed to the public due to safety concerns. Information: 541-347-2209. 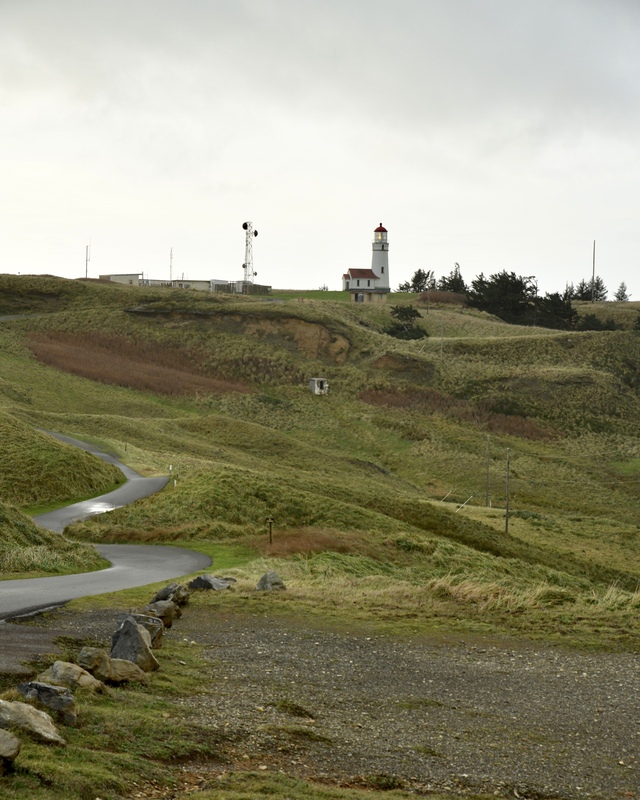 Cape Blanco’s conical tower is perched 256 feet above sea level on Oregon’s westernmost point. 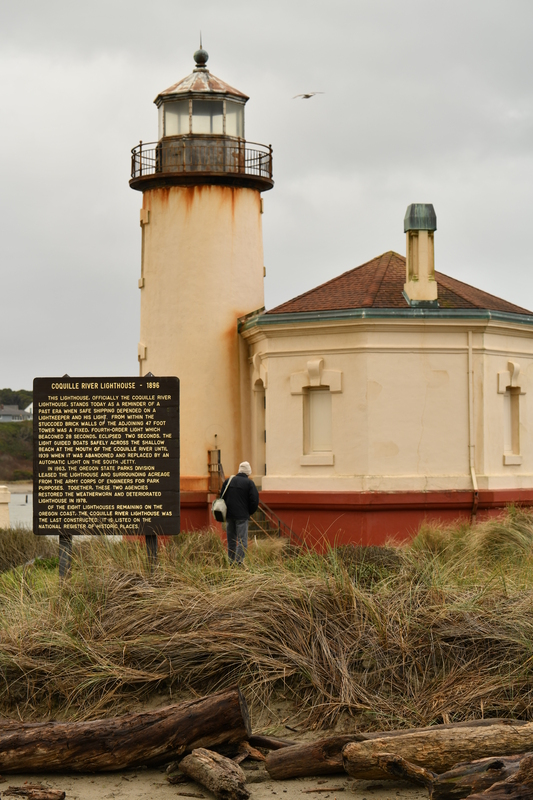 It is the oldest standing lighthouse on the Oregon coast, commissioned in 1870 to aid shipping generated by gold mining and the lumber industry. Daily guided tours are offered 10 a.m. to 3 p.m. April through October (closed Tuesdays). Thank you for the tour and the info, Jane! A beautiful set of series. I’m happy you enjoyed enjoyed the tour. It was fun being the guide! Thank you for sharing your enlightening study! They all have such romantic settings, but the hermit in me likes the Cape Arago Lighthouse the most! I think it is interesting that you selected this particular lighthouse. It has been decommissioned, and the property returned, through Federal legislation, to the Confederated Tribes of the Coos, Lower Umpqua and Siuslaw Indians- Indians who lived in villages near the bay prior to white settlement. According to the legislation, the tribes must make the light station available to the general public for educational, park, recreational, cultural, or historic preservation purposes at times and under conditions determined to be reasonable by the Secretary of the Interior. The land was once a burial area. In 1975, the Confederated Tribes obtained an Indian Burial Ground Easement on the mainland opposite the present lighthouse. Today, several markers are found there. You selected a lighthouse with an interesting history.